This question is prompted by a paragraph in Randall Munroe’s what if? post the other day entitled “What if New Horizons hit my car?” (in turn based on a question by Robin Sheat). The answer to that question was, “it would be pretty bad for both vehicles,” although as is so often the case it’s not so much the answer but the explanation. But as long as we’re talking about the answer, it would in fact be pretty bad. 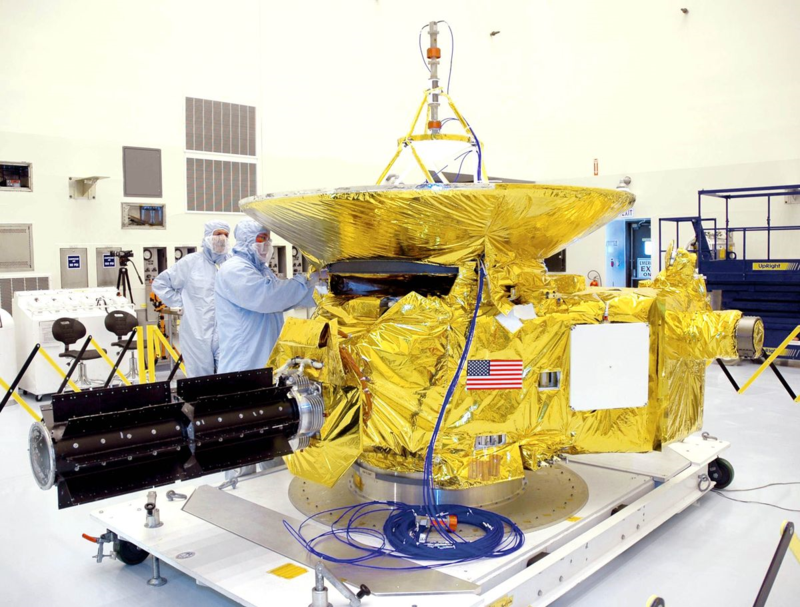 The New Horizons spacecraft weighs over 1,000 pounds (478 kg), and is about the size and weight of a concert grand piano. And while it would be bad if a grand piano hit your car, it’d be worse if the grand piano were traveling at over 30,000 miles per hour. (That’s almost 50,000 kilometers per hour, but somehow kph is still less impressive.) Moving at more than eight miles (or 14 km) every second, New Horizons is one of the fastest objects the species has ever created. And you parked right in front of it. Nice job, genius. Oh, also, it’s powered by a nuclear generator, so the tiny pieces of your car that are now on their way to the Kuiper Belt are also radioactive. Randall included a couple of legal points in his analysis, concluding that—and this is the good news—(1) NASA would have to pay for your car and (2) because you wouldn’t be at fault, in most states your insurer would be legally prohibited from raising your premiums. I think those answers are both right if we assume, as he does, that your car was parked at home and New Horizons was rather dramatically off course. I want to assume, though, that your car was orbiting Pluto. Correction: As Prof. Jonathan Weinberg has pointed out, the treaty wouldn’t control this, because the part that says it doesn’t apply to a launching state’s own nationals is also the law of the land. That doesn’t mean NASA is necessarily off the hook, just that its liability would have to be determined by some other provision of U.S. law, not the treaty itself. That probably means the Federal Tort Claims Act and/or the regs governing Claims Against NASA or Its Employees for Damage to or Loss of Property or Personal Injury or Death. The result’s probably the same, but neither of us are space lawyers, we hasten to add. But if you were “parked” out near Pluto, the answer is less clear. Under Article III of the Convention, if a space object causes damage in space to another space object (which your car would be in this scenario), then whoever launched the former is only liable if they were at fault. And the question of fault is also relevant to the second question—whether your insurance company could raise your rates as a result of this space casualty. Certain other factors determined by the insurance commissioner. Up to this point, I think you are in pretty good shape. Let us assume that the insurer is able to get an adjuster out there to do the required investigation. (We are assuming you could get your car out there, after all.) Ordinarily there might well be a decent argument that you were at fault. Questions such as “what was a 1972 Buick LeSabre doing in Pluto orbit to begin with” do come to mind. You probably didn’t remember to tell NASA about this before launch, and New Horizons did not have much fuel for course corrections afterward. But the good news for you is those presumptions. You were lawfully parked, or at least not unlawfully parked. I don’t see any street signs in any of these pictures so far. There is also no question that you were the victim of a hit-and-run. The thing is already almost 700,000 miles (over 1.5 million km) from the site of the (imaginary) accident, and I doubt NASA left any insurance information on your now-radioactive windshield fragments. You might even take a run at arguing your car was hit by a “falling object.” It’s falling toward something, isn’t it? If any of those arguments worked, I’m not sure the insurer could overcome the presumption, no matter what the adjuster’s report says. But there is also very bad news for you: the number of miles driven annually. Assuming you wish to insure your next car with the same insurer, this factor may be a problem. The issue would be how many miles the insurer can reasonably expect you will drive that car, not how many you drove the last one. But it would seem relevant for the insurer to bring up the fact that, assuming you drove 65 mph the whole way, your most recent vehicle was driven approximately 569,400 miles per year in each of the past 5,209 years. You could certainly argue that you’re not likely to do that again, but I think there might be a premium hike in your future. Clarification: The paragraph above assumes that you accelerated to 65 mph and then coasted the rest of the way to Pluto. To get yourself “parked” there you would also have to decelerate, of course, and you could get there faster by accelerating for the first half of the trip and then turning around and decelerating. (The giant assumption there is that you have enough gas to do it. This is why New Horizons just did a flyby; there wasn’t enough fuel to orbit.) That raises lots of other issues, though, because after the first couple of years, even a 1972 Buick LeSabre would be traveling at a significant fraction of the speed of light (assuming the standard 350 engine and a 0-60 of about 10 seconds, which works out to .27g of acceleration). In other words, I did not even try to account for relativity. But I think the conclusion is still a reasonable one.